It is Arthropodium cirratum ‘Matapouri Bay’ that is the best known variety of this ornamental strap leafed grass like plant. 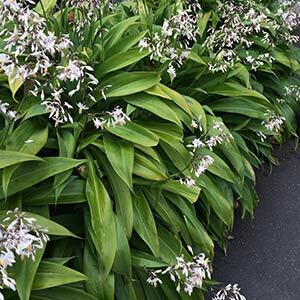 Commonly known as the Renga Renga Lily, Arthropodium cirratum is one the best landscaping plants for dry shade. Evergreen, growing well in poor soils and coping with both dry and wet conditions. With broad strap like foliage A. cirratum grows well in all soils as long as drainage is good. The flowers that appear in summer are attractive and rise above the foliage in sprays. Used widely in commercial landscaping where a low care plant is needed for shade. Useful as a border or edging plant and well suited to mass planting as a permanent ground cover. With its lush green foliage,Arthropodium cirratum can be used to underplant a range of taller plants to help create a tropical looking area in the garden. Once established, Arthropodium cirratum is remarkably low care. Protection from snails and slugs may be required when first planting and as clumps develop. Although tolerant of poor soils, growth rate will be faster and plants will perform better in good soils. Mulch around new plants to suppress weeds and water new plants in well. A. cirratum White Knight – Taller growing with a touch of Purple in the flowers. Spread – To around .5m however clump forming over time. Position – Morning sun, filtered light or dappled shade. Soil – Humus rich well drained although not fussy.